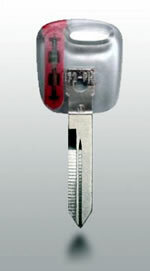 , which uses an encrypted transponder in the key. Hold on there... What is PATS, how does it work, and why is this important to me?
. In 1996 it started showing up on select models of Ford and Lincoln Mercury vehicles. The keys for these vehicles have a tiny radio frequency transponder imbedded in the plastic Head. When you attempt to start the vehicle, the onboard computer sends out a RF signal that is picked up by the transponder in the key. The transponder then returns a unique RF signal to the vehicle's computer, giving it the ok for the vehicle to start and continue to run. This all happens in less than a second, and is completely transparent to the vehicle operator. It is a very effective system that does its job without the vehicle owner having to think about it, or modify his / her usual routine.
. No longer can you pick up an extra car key at the checkout stand of your favorite hardware store. must be originated on a new keyblank that has an embedded transponder. The vehicles onboard computer must be programmed to recognize the new key. This brings us to the "why is this important to me" part. With PATS I, as long as you have at least one working key and can read the owners manual that came with the vehicle, you've got a good shot at programming your new key without additional assistance.
. The down side is that many vehicle owners don't think about making extra keys until they only have one, or even worse no keys! If you own a vehicle equipped with the PATS II system and find yourself in this situation, you have a couple of choices. who has electronic programming equipment and is qualified to use it come to your vehicle and do the same. While option #2 is many times more convenient, neither solution is inexpensive. made and programmed at once. PATS I equipped vehicles include the following. made and programmed at once. PATS II equipped vehicles include the following.